It is easy for someone accustomed to the small-scale landscapes of Europe to be mesmerised by the immensity, grandeur, and extremes of Asia. It is the largest continent, covering 17 million square miles, or an area larger than Africa and Europe combined. It has the fifty-six highest mountains in the world, but also the two lowest places on the earth's surface: the Dead Sea (−405 m) and the Turfan Depression, North China (−154 m). Tibet, with an average altitude of 5,000 m and an area half that of the United States, is the world's highest and largest plateau, and also has the world's deepest valleys, such as the 5-km-deep Yarlung Zangbo. The Caspian Sea, one-and-a-half times the size of Britain, is the world's largest inland sea, and Lake Baikal is the world's oldest, deepest, and largest (by volume) lake, with one-fifth of the world's fresh water (Chapter 3). Asia contains six of the ten longest rivers in the world, and most of those with the largest sediment discharge. Cherrapunji in Northeast India, where a ridiculous 26,461 mm (86.75 feet) of rain fell in 1860–61, including 9,300 mm (30 feet) in one month (Guinness World Records 2004:68), qualifies as the wettest place ever recorded,1 yet several of Asia's deserts – such as the Rub⼹al Khali of Arabia and the Taklamakan of North China – are among the most arid and hottest parts of the world. At Verkhoyansk, Eastern Siberia, winter temperatures can fall to −68°C (−90°F), thus making it the coldest part of the northern hemisphere; because summer temperatures there can exceed 37°C, its annual temperature range of 105°C. is the widest in the world (Guinness World Records 2004:68). Siberia, covering one-twelfth of the earth's land surface, has permafrost up to 1.5 km deep (Tumel 2002:149). Asia is and has been more prone to natural disasters than any other continent: these include Tambora (Sumbawa, Indonesia) in 1815 – “the year without a summer” – which was the largest volcanic eruption in historic times, and Toba (Sumatra, Indonesia), which erupted ca. 74 ka (thousand years ago) and was the largest in the last 2 million years. It is also cursed with the world's most lethal earthquakes, tsunamis, cyclones, and floods. Most of Asia between Japan and Turkey is prone to major earthquakes; tsunamis normally strike the Pacific coastline, with terrible exceptions such as the tsunami of 2004 that devastated the coasts of the Indian Ocean. East Asia is also particularly prone to floods, and not for nothing is the Yellow River (Huang He), which drowned several hundreds of thousands of people in 1887 and 1931, named China's Sorrow. Nowadays, Asia is also the most populous continent, with over half the world's population and the two countries (China and India) with the largest populations. Parts of Asia, such as Java in Indonesia, have some of the highest densities of population in the world, with almost 2,500 people per square mile, or 600 times more than Mongolia, the most sparsely populated country in the world, and much of the Arabian Peninsula, Central Asia, and Siberia have even lower densities of population. For the palaeoanthropologist, the primary significance of Asia is that it was the largest area colonised by hominins. The distances that were eventually covered, on foot and by bipeds which were less well equipped and generally smaller than we are, are often hard to comprehend. ⼸Ubeidiya and Majuangou, the oldest sites yet found in Israel and China, respectively, are 4,400 miles apart, or roughly the distance (in air miles) from New York to Sarajevo; ⼸Ubeidiya, where hominins are known from ca. 1.4 Ma (million years ago), is 5,600 air miles from Java, where they are first recorded a little earlier, ca. 1.6 Ma. The same distance separates the site of Boxgrove in the United Kingdom from Swartkraans in South Africa, or Paris from San Francisco.2 The hominins that may have ventured into northern Central Asia before the last interglacial were as far north from those on the island of Flores in Indonesia as London is from Kinshasa in Zaire. By the end of the Middle Pleistocene, ca. 125 ka, Asian hominins were spread across seven time zones, and had settled, even if briefly and often intermittently, in an area of some 10 million square miles. The colonisation of this vast and varied continent constitutes one of the major and most exciting themes of human evolution over the last 2 million years, and is the main focus of this book. Beyond its intrinsic interest, Asia has a wider relevance in palaeoanthropology because it was also the continent through which hominins had to pass in order to reach Europe, Australia, and North America, and the early prehistory of these continents cannot be properly assessed without some reference to developments in their Asian neighbour. Western Europe was reached by at least 1 Ma, but indications that it was settled in cold glacial as well as warm interglacial periods are scarce before ca. 600 ka (Chapter 11). Australia and North America were different matters, and beyond the capacity of hominins prior to Homo sapiens (and thus sadly beyond the scope of this book). The colonisation of Australia required the use of seacraft that could be navigated by paddle or sail, as it could not be reached by reliance upon surface currents, and the first humans arrived there ca. 50 ka or perhaps a little earlier. Alaska could be reached overland across Beringia, the subcontinent across the Bering Straits that was exposed at times of low sea level, but this required the ability to cope with the exceptionally cold conditions of Northeast Siberia.3 On current estimates, modern humans did not arrive in Alaska until the end of the Pleistocene, ca. 12 ka. Nevertheless, it is worth noting that much of Asia proved more inaccessible to modern humans than Australia. The earliest indications of humans on the Tibetan Plateau are only 30–40 ka (Yuan et al. 2007), and thus substantially younger than the earliest Australian evidence; Siberia, covering one-twelfth of the earth's surface, was probably not permanently colonised until after the glacial maximum (Goebel 1999), long after humans had reached Australia. For reasons still unclear, hominins did not venture into southern India south of the Kortallyar Basin, or Sri Lanka (Chapter 9), even when exposed at times of low sea level, until ca. 28 ka, by which time modern humans had already reached Portugal and Australia. Although palaeoanthropology (and particularly Palaeolithic archaeology) first developed in Europe in the early nineteenth century, comparable research in Asia is almost as old. The first monograph on Siwalik fossils was published in 1845 (Chapter 5), and the first Acheulean handaxes in India were recorded in 1863 (Chapter 9), only four years after their antiquity was confirmed in Britain and France. The earliest Palaeolithic find from Siberia (from the military hospital in Irkutsk) dates from 1871 (Derev⼹anko 1998:1), and the first cave explorations in Indonesia date from the 1880s (Theunissen 1989:39–42).4 These discoveries all occurred before comparable ones in Africa.5 In the late nineteenth and early twentieth centuries, many researchers thought that the origins of humanity lay in Asia rather than in Africa. Although Darwin (1871:161) suggested somewhat half-heartedly (Chapter 6) that humanity originated in Africa because our closest relatives, the chimpanzee and gorilla, live there, others thought that Southeast or East Asia was more likely. In one of the most bizarre models ever proposed in palaeoanthropology, Ernst Haeckel suggested in 1876 that the ancestors of humankind lived on a hypothetical continent named Lemuria, which sank in the Indian Ocean (Bowler 1986:67–8). Those ape-like survivors that reached mainland Southeast Asia evolved into humans and the orang-utan, whereas those that reached Africa eventually became the gorilla and chimpanzee. According to Haeckel, the earliest hominin was an ape-like creature named Pithecanthropus alalus, or speechless ape-man. (It was presumably speechless because of its small brain rather than because of its outrageously improbable origins.) Although Haeckel's model was implausible and unencumbered by any evidence for or against it, the young Dutch physician Eugène Dubois was sufficiently excited by it to obtain employment in the Dutch East Indies so that he could search for fossil evidence for this creature. Eventually, he found in 1891 at Trinil on Java the skull-cap and femur of what was then the oldest and most primitive hominin specimen ever found (Chapter 5). He initially named his find Anthropopithecus erectus (the upright man-ape), but later renamed it Pithecanthropus erectus, partly in homage to Haeckel (Theunissen 1989:54–60). Many decades later, the Trinil find was reclassified again, this time as Homo erectus, the earliest known inhabitant of Asia. A more coherent and plausible model of human evolution than Haeckel's was proposed in 1915, when Matthew published his Climate and Evolution. He argued that mammalian evolution was driven by climates that were challenging and continually changing, and none were more so than on the harsh and strongly seasonal Tibetan Plateau. Those species that could flourish there were then able to colonise neighbouring regions, thus displacing more primitive and less competitive types that either became extinct, or ended up in faraway regions such as Africa. Thus the presence of the chimpanzee and gorilla in Africa was not, as suggested by Darwin, indicative of where humankind had evolved, but of where primitive forms of apes had ended up. A more notable advocate of this line of reasoning was Davidson Black, a young Canadian anatomist, who published in 1925 a major essay, “Asia and the Dispersal of Primates”, and took up employment at the Peking Medical College so that he could be at hand if and when the relevant fossil material was found. Already, by then, a hominin tooth was known from the cave site of Choukoutien (now Zhoukoudian) near Beijing; when a well-preserved one was found in 1927, Black was quick to name it Sinanthropus pekinensis, and see it as proof that human origins lay in East Asia. By the time that excavation stopped at Zhoukoudian in 1937, it had produced the largest collection of early hominin fossils in the world (Chapter 10). The importance of East Asia was enhanced further by other discoveries in the 1930s in Java, first at Ngandong on the Solo River (1931–3) (Chapters 7 and 10), then at Mojokerto (1936), and then on the Sangiran Dome of central Java (1936–8) (Chapter 5). By the outbreak of World War II, almost all the key evidence for human evolution came from East Asia, and the rest from Europe, notably the Mauer mandible from Germany in 1908 (then and now the type specimen of H. heidelbergensis) and the infamous and fraudulent Eoanthropus dawsoni from Piltdown, United Kingdom. Africa, meanwhile, was thought to lack any fossil evidence for early human evolution. Dart's recognition of Australopithecus africanus at Taung in 1925 and Broom's discoveries of Paranthropus at Swartkrans and Kromdraai in South Africa in the 1930s were dismissed by most specialists6 as primitive apes or ape-like forms that had been displaced there by more successful types that had originated in Central or East Asia. In East Africa, Louis Leakey's discoveries in the 1930s of hominin fossils at Kanam and Kanjera were deemed suspect because of confusion over where precisely they had been found. Furthermore, the chronological framework then available seemed to suggest that the Early Acheulean in East Africa was the same age as that in Europe (see Leakey 1934:90), and not, as we now know, almost a million years older. With only a few exceptions, most authorities in the 1930s regarded Africa as a dead end that had contributed nothing significant to human evolution. Nowadays, of course, it is Africa rather than Asia that is seen as being of paramount importance in human evolution.7 As shown in Chapter 2, Africa now has all the fossil evidence >2 Ma for hominins (including our own genus Homo), as well as the earliest evidence (currently 2.6 Ma) for tool-making and carnivory. (As discussed in Chapter 6, however, it also has a Pliocene faunal record that is much richer than that of Southwest and other parts of Asia, and thus the absence of such evidence outside Africa does not necessarily constitute genuine evidence of absence.) This point aside, the earliest hominins currently recorded outside Africa date to ca. 1.8 Ma (Chapter 4), and the history of our genus in Asia over the last 1.8 million years constitutes a large part of its history in the Old World. Although there are still many large gaps in our knowledge, an enormous amount of information is now available on the archaeological and fossil hominin evidence and its climatic background. Before we proceed to examine this evidence in detail, a brief summary of some of its main features is appropriate. Our main sources of knowledge about H. erectus in Asia are still the Sangiran Dome, Java (Chapter 5), and locality 1, Zhoukoudian, North China (Chapter 10), both of which were investigated before 1939, but have since continued to provide important new information. Two of the most exciting discoveries in recent years have been the hominins of 1.8 Ma from Dmanisi, Georgia (Chapter 4), and the Late Pleistocene “hobbits” from Liang Bua, Flores, Indonesia. Both (especially Dmanisi) have enormous implications for studies of hominin evolution within and beyond Asia. There are also several Early Palaeolithic sites in Asia that have major widespread significance. ⼸Ubeidiya is one of the key Early Pleistocene archaeological sites in the world, and continues to provide new information (Chapter 4), as do sites such as Majuangou, Xiaochangliang, and Donggutuo in the Nihewan Basin of North China, which have recently added much to our knowledge of the earliest hominins in East Asia (Chapter 5). Several outstanding Middle Pleistocene sites are known from Asia. One of the most fascinating is Gesher Benot Ya’aqov in Israel, ca. 800 ka, with an Acheulean assemblage similar to those found in East Africa, and evidence of fire, plant processing, and perhaps big-game hunting (Chapter 8). Another is the Acheulean, Middle Pleistocene site of Isampur, India, which is probably the world's oldest quarry (Chapter 9), where tabular blocks of limestone were removed and used for making handaxes. The Bose Basin in South China is a third major discovery (Chapter 10); here, very large, handaxe-like tools from ca. 800 ka have been found, in a region well beyond the “Movius Line” that demarcates the Acheulean assemblages of Southwest and South Asia from the flake and core assemblages of East and Southeast Asia (see Chapter 10). Mata Menge on Flores, Indonesia, is another major recent discovery, this time of the colonisation of an island ca. 800 ka by the earliest known accidental or purposeful sea-crossing by hominins (Chapter 10). For the later part of the Middle Pleistocene, the cave of Tabun, Israel, is still one of the major flagship sites of the Old World. Other important Middle Pleistocene cave sites in Southwest Asia are Jabrud, Qesem, and Hayonim in the Levant and Kara’in and Yarımburgaz in Turkey (Chapter 8). There has also been a quiet revolution in dating archaeological sites and fossil hominin specimens that is still ongoing, and that will have major consequences for our understanding of when things happened. Asian sites that feature prominently in recent chronometric investigations are the open-air sites in the Sangiran Dome, Java, and the Nihewan Basin, North China (Chapter 5), the caves of Tabun, Qesem, and Hayonim in Israel (Chapter 8), and Locality 1, Zhoukoudian, North China (Chapter 10); others include the hominin remains from Jinnuishan, Tangshan and Hexian, China (Chapter 11). These all now appear older than first thought, but other specimens – notably the hominin cranium from Mojokerto, Java – now seem to be much younger (Chapter 5). The last fifteen years have seen a staggering amount of new and detailed information on Asia's climatic history over the last 10 or even 20 million years (Chapters 3 and 7). Most of this has been published in English in major international journals, and often at a rate that is difficult to monitor. The largest single contribution has come from studies of the Loess Plateau of North China, the sequence of which now extends back some 22 million years. The last 2.5 million years is now recorded in almost as much detail as the better-known ocean isotope record, and is unquestionably the finest terrestrial climatic sequence of its age in the world. The loess record of Central Asia, covering 2.5 million years, is almost as finely documented. Another superlative climatic record, this time extending back 10 million years, has been obtained from cores taken from the floor of Lake Baikal, Siberia. As a result, the record of climatic change in continental Asia from the Late Pliocene to the end of the Middle Pleistocene is probably better now than that of Europe or Africa. Oceanographers have also been busy off the Asian coastline, and valuable new evidence, often at an extremely high resolution, has been obtained from the North Pacific, the South China Sea, the Indian Ocean, and the Eastern Mediterranean. Taken together, these studies allow a remarkably detailed picture to be built up of the history of the Asian monsoonal system that dominates almost every part of the continent, including those regions outside its area of summer rainfall. Large amounts of data have also been collected on Asia's tectonic history over the last 5–15 million years, particularly for the Tibetan Plateau, North China, and the Himalayas and Karakorum Mountains. These show substantial and often dramatic changes within the last 2 million years on a far greater scale than that seen in Europe or Africa, and many of these changes had major effects on regional climate and on the ability of hominins to disperse between regions. As argued in Chapters 6 and 11, hominin evolution in Asia (and the Old World generally) has to take account of the climatic and environmental evidence now available from Asia. The primary aim of this book is to set down what is currently known about Asia's prehistory, fossil hominin record, and climate and environment before the last interglacial. This event was chosen as an endpoint for two reasons: first, it provides a reasonably clear marker horizon that can be traced across much of Asia; and second, it coincides (on current evidence) with the appearance of modern humans (H. sapiens sapiens) in Southwest Asia. Their subsequent worldwide expansion in the last glaciation is such a rich and complex story that it requires a separate volume. The book has two main sections. The first part deals with events, processes, and evidence prior to ca. 1.0–0.8 Ma (or roughly the beginning of the Middle Pleistocene). Chapter 2 discusses the African evidence for hominin evolution up to and including H. erectus, the first hominin recorded in Asia. Chapter 3 reviews the climatic background to hominin evolution and dispersal in Asia, with particular attention to the Asian monsoonal weather system. The various strands of evidence for hominins in Asia before ca. 0.8 Ma are covered by Chapters 4 and 5, including the recent evidence from, in particular, Dmanisi, Georgia, as well as the recent dating of the earliest sites in China and Java. In Chapter 6, I discuss the validity and plausibility of the “Out of Africa 1” model as currently formulated and suggest that we are at the beginning of a major rethinking of our views on when Asia was first colonised, and on the origin of Homo erectus. The second part of the book deals with events between ca. 0.8 Ma and the last interglacial ca. 125 ka. The climatic background of this period in Asia is reviewed in Chapter 7, and Chapters 8–10 present and discuss the Asian archaeological and fossil hominin evidence. This evidence is discussed in Chapter 11 with reference to the African and European evidence for human evolution in the Middle Pleistocene. I argue here that insufficient attention has been paid to the repeated isolation of hominin populations within and between Europe, Africa, and Asia and the likelihood that much of continental Asia might even have been uninhabited during the coldest and driest parts of the later Middle Pleistocene. As with assessments of the colonisation of Asia in the Late Pliocene, I suggest that a major rethinking is now required about human evolution in the Middle Pleistocene, including the colonisation of Europe and the appearance and expansion of modern humans outside Africa. Finally, the book ends with some general reflections on what we currently think we know about early Asian prehistory, and what we most need to know. During the writing of this book, I was very aware that I was trying to serve two purposes. 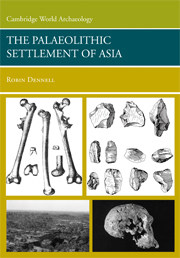 The primary aim was to produce a volume that will (I hope) serve as a source of reference for those unfamiliar with some or most of the archaeological, fossil hominin, and climatic evidence from Asia before 100 ka. The other aim was to provide my own views and interpretations of this evidence in order to encourage debate, and to suggest future research directions: in short, to stick my head above the parapet and articulate my own thoughts about a set of data and the issues it raised. Each chapter therefore ends with my own assessments of the significance of the material discussed in that chapter, including some of its implications for evidence discussed in other chapters. Readers may disagree with some (or even all) of my assessments, but debate and discussion are vital to the way that a discipline such as palaeoanthropology develops. There are also four appendices: the first shows the area of each Asian country and region, two provide latitudinal and longitudinal coordinates of Asian archaeological and geological localities, and the fourth provides a list of common names for some Asian and fossil mammals that may be unfamiliar to readers. 1 Mawsynram, also in Northeast India, is currently listed as the wettest place on earth, with a comparatively modest average rainfall (over 38 years) of 11,873 mm, or ca. 39 feet (Guinness World Records 2004:68). 2 London–Johannesburg is 5,617 air miles; Paris–San Francisco is 5,683 air miles; Jerusalem–Yogyakarta is 5,643 air miles; New York–Sarajevo is 4,477 air miles; and Tel Aviv–Beijing is 4,455 air miles (Fitzpatrick and Modlin 1986). 3 Although Beringia is overwhelmingly cited as the preferred route by which humans arrived in the Americas, Bradley and Stanford (2004) suggest that North America was reached from western Europe across the pack ice by Upper Palaeolithic Solutrean groups. Neither route need of course exclude the other. 4 British researchers knew about the great cave system of Niah, Borneo, in the 1850s, and even sponsored a generally unproductive expedition to investigate caves in Borneo in 1878 (see Sherratt 2002). 5 As example, Lake Turkana (formerly Lake Rudolf) was not discovered by Europeans until 1888, and the first European visit to Olduvai Gorge (by Kattwinkel) was not until 1911 (Leakey 1951:1). 6 Gregory (1938–9), from the American Museum of Natural History, New York, was a notable exception. 7 The background to this relocation of humanity's origins is discussed in Dennell (2001).